• Full colour Everton Football Club crest. • 100% polyester. Club: Everton FC. Colour: Blue. Club: Everton FC. Colour: Blue. Size: Large. Features Pickford 1on the back of the shirt. Colour: Blue. Size: Large. 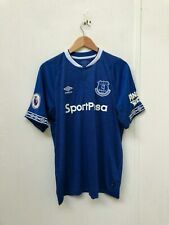 EVERTON 2007/08 HOME SHIRT SIZE LARGE IN VERY GOOD CONDITION UK BIDDERS ONLY COULD ALL SUCCESSFUL BUYERS PLEASE LEAVE FEEDBACK ONCE ITEM IS RECEIVED. MANY THANKS! Defect Detail: P rint error: D in Sigurdsson has tiny cracking. Features Sigurdsson 10 on the Back. Club: Everton FC. Club: Everton FC. Features Rooney 10 on the Back. Club: Everton. Defect Detail: Not a Everton Player. IT HAS PREMIER LEAGUE SLEEVE BADGE. SIZE GUIDE. IT HAS THE PREMIER LEAGUE SLEEVE BADGE. SIZE GUIDE. Has Rooney 10 printed on the back of the shirt. Colour: Blue. Size: Large. Club: Everton FC. New with Defects. Club: Everton FC. Features Walcott 11 on the Back. Size: Large. Features Sigurdsson 18 on the Back. Colour: Blue. Plain LS Shirt. Colour: Blue. Size: Large. Club: Everton FC. Size: UK 8. New with Defects. IT HAS THE PREMIER LEAGUE SLEEVE BADGE. SIZE LARGE. SIZE GUIDE. Club: Everton FC. Size: UK 12. Defect Detail: P rint error: Has small glue mark. Features Richarlison 30 on the Back. Club: Everton FC. GREAT QUALITY SHIRT FOR THE ICELAND STAR NO 18. Club: Everton FC. Features Y.Mina 13 on the Back. IT HAS NO PREMIER LEAGUE SLEEVE BADGE. SIZE GUIDE. EVERTON 2017/18 SHORT SLEEVED AWAY SHIRT. IT HAS PREMIER LEAGUE SLEEVE BADGE AND ANGRY BIRDS LOGO. SIZE SMALL. SIZE GUIDE. Features Sigurdsson 10 on the Back. Club: Everton FC. Size: UK 10. Features Niasse 19 on the back. Colour: Blue. Material: 100% Polyester. Made by UMBRO. SEE MY OTHER FOOTBALL SHIRTS. Heat transfer Sportpesa sponsor to chest. Embroidered Everton badge and Umbro logo to chest. Size UK 12 (18" pit to pit) (26" top of shoulder to bottom front hem, 27" to rear). Quality shirt 100% genuine. Also Features Premier League Badge and Club Sponsor on Sleeves. Colour: Blue. Everton shirt 1999-2000 size large, Umbro, VGC, UK FREEPOST! For adults size large, armpit to armpit is 58cm, length 78cm at the front and 82cm at the back. Official 1999-2000 Umbro item in very good condition. Club: Everton FC. Defect Detail: P rint error: Has FIFA Word champions badge on chest. Made by Umbro. It is our joy to find you that long lost shirt, that one shirt you wore when you were a child, that one shirt that completes your collection. Shirt is in excellent condition, main flaw is wear to the sponsor.